Situated in the Horn of Africa, Ethiopia is the most populated landlocked country in the world with a population of over 90 million. Unlike most other African countries, Ethiopia has maintained its freedom from colonial rule apart from a five-year occupation by Mussolini's Italy in 1936-41. It was a founder member of the United Nations. After a series of famines in the 1980s, the country has begun to recover and is now the largest economy in East and Central Africa. Médecins Sans Frontières/Doctors Without Borders (MSF) first worked in Ethiopia in 1984. Our work in the country involves responding to armed conflict and endemic/epidemic disease. 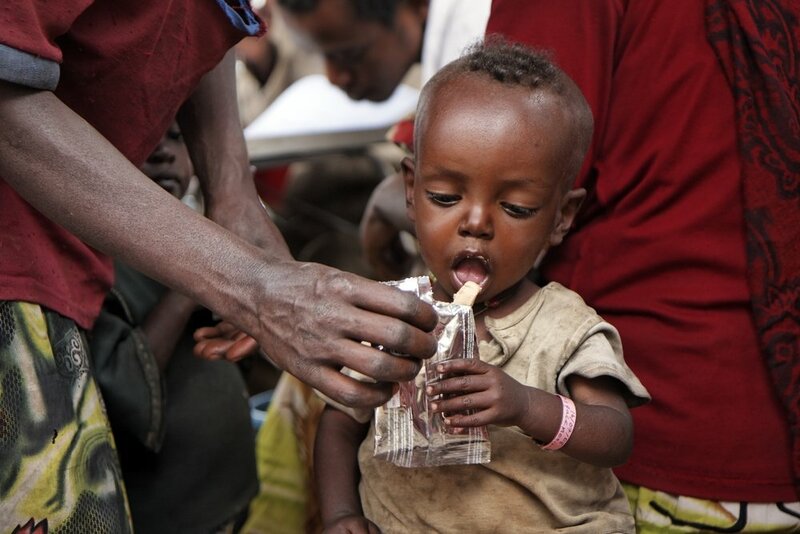 Over the year, MSF responded to a major nutrition emergency in Doolo and Jarar zones, Somali region. More than 3,400 children were admitted to MSF’s inpatient therapeutic feeding centres and therapeutic food was distributed to another almost 14,000 children enrolled in the outpatient programmes across the region. Support rations were also given to patients’ families. In addition, Somali region suffered one of the biggest outbreaks of acute watery diarrhoea in recent years. MSF teams provided drugs, set up treatment centres all over the region and treated 18,302 suspected cases. Since 1995, MSF has been present in Dolo town, Liben zone, on the border with Somalia. The health centre in Dolo Ado provides basic healthcare to the local community, as well as to refugees who have fled violence and food insecurity in Somalia and settled in five camps in the zone. MSF also treats many Somali nationals who cross the border in search of medical care. MSF has constantly worked to improve medical care in the health centre, and in 2017 started to offer X-ray services and basic surgery. Over the year, 31,588 outpatient consultations were carried out and 3,671 patients admitted for care in Dolo Ado. 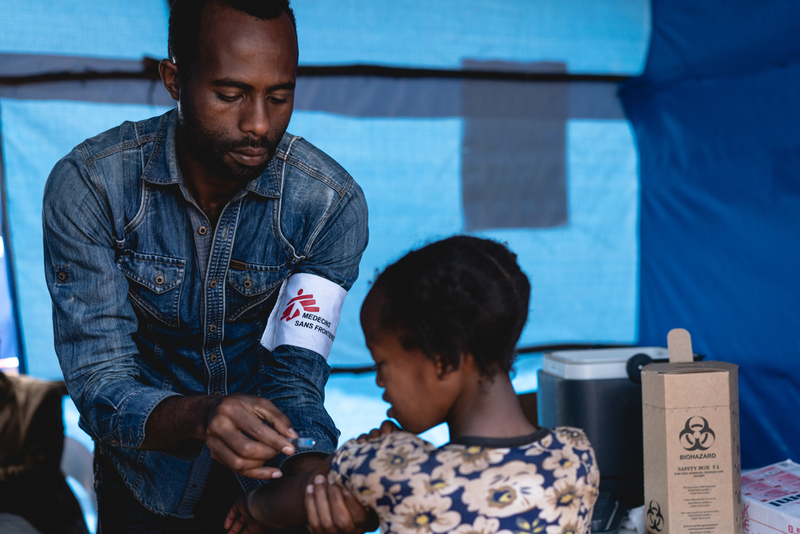 MSF teams provide care in two health posts in Buramino and Hilaweyn camps and assess the health of new arrivals in the refugee reception centre. In the towns of Fik and Degehabur, MSF supports government hospitals with specialised medical staff and donations of drugs. MSF started working in Wardher, Doolo zone, in 2007. Before the large-scale emergency response in the region in mid-2017, the project supported the local hospital’s maternity and paediatrics departments, and also ran a tuberculosis programme. Other teams worked in health centres in Danod and Yucub and operated an average of 10 mobile clinics. During the emergency, many of these services were suspended or adapted according to needs and new activities were launched. More than 50 oral rehydration points and 30 outpatient feeding centres were set up. A new project site was opened in Geladi, providing medical care and water supplies. MSF treated 235 patients for acute jaundice symptoms and 235 cases of measles. When the situation had stabilised, the number of outpatient feeding centres was reduced to around a dozen. The team increased activities in these remaining centres to provide care for all children under the age of 15. Almost 26,500 children were vaccinated against measles and over 26,780 consultations were conducted. In 2017, MSF increased its support to Gambella hospital, the only facility in the region offering specialised medical care for a population of 800,000, half of them refugees from South Sudan. Teams worked in the emergency room, operating theatre, surgical inpatient unit and maternity department. During the year, MSF saw 29,310 patients in the emergency room, performed 1,468 surgical interventions and assisted 1,230 deliveries. MSF also worked with the Ethiopian authorities in Kule and Tierkidi refugee camps in Itang district, which together provide shelter for over 120,000 South Sudanese refugees. Teams worked in a health centre and six health posts, offering most medical services except surgery. MSF conducted more than 300,000 outpatient consultations and admitted 1,995 patients for care. In addition, teams ran vaccination campaigns, and operated mobile clinics at a number of entry points to the camps. 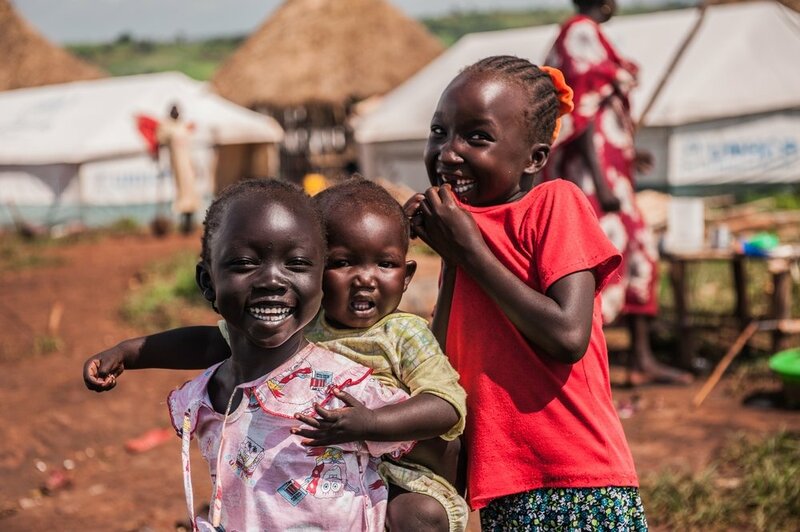 Other MSF teams provided care to South Sudanese refugees and the local communities around Pugnido. Staff supported the hospital emergency room, intensive care unit, inpatient department and maternity unit, conducting a total of 46,484 outpatient consultations, admitting 2,350 patients, and assisting 188 deliveries. Malaria was one of the biggest problems seen across the camps in 2017, with over 72,000 cases treated. Sudanese refugee children at the camp in Bambasi, Ethiopia. 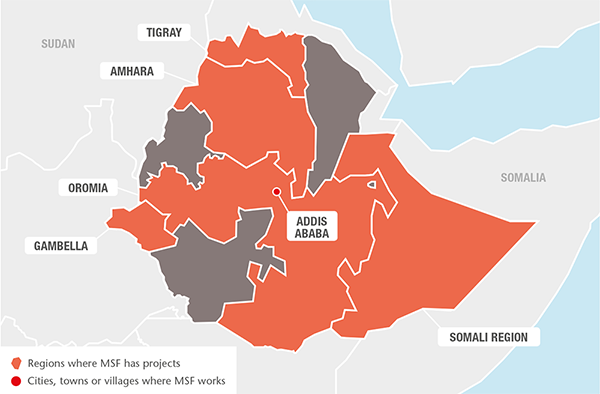 Since 2002, the MSF project in Abdurafi has been carrying out research on kala azar (visceral leishmaniasis) in conjunction with the Institute of Tropical Medicine Antwerp, the University of Gondar and the Ethiopian Public Health Institute. The project seeks to develop better treatment methods for complicated kala azar cases. The team in Abdurafi is also trying to find a more effective snakebite antivenom. In 2017, 322 patients received treatment for snakebites, and 299 for kala azar.